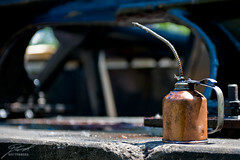 There's not much of a story to this one, just that I spotted this little can next to a piston at the Saw Mill demo at the Crossroads Village & Huckleberry Railroad. I'd have loved to work this a little more but the fence and fact that the equipment was running at the time. There's just something about the contrast of the copper, even though it's dirty, against the dark, black iron of the heavy machinery.